It's bigger and better in every way that counts. The first time I strapped on an Apple Watch was three years ago. A friend had been needling me about how badly I needed one and how it was the first truly new Apple product since Steve Jobs died and how cool Digital Touch was. I caved, and 45 minutes later, I had claimed a slice of Apple's history for myself. That wouldn't be true with the Series 4. During the past three years, Apple has dutifully added features and refined the overall Watch experience. Series 2 pivoted to focus more on fitness. Series 3 had an LTE radio, so you could feasibly leave your phone at home. It wasn't until this year's Series 4, though, that the Apple Watch finally seemed to step out of the iPhone's shadow. The Series 4 is bigger and better in every way that counts, and more important, it now feels like a fleshed-out, worthy device in its own right. Earlier Apple Watches were impressive wearables, but the new Series 4 is the strongest argument yet for wearing a smartwatch. And that’s not just because of bigger, edge-to-edge screen or its improved fitness tracking either. The combination of a more powerful processor and thoughtful, feature-rich software make the Series 4 the most capable wearable around. Solid battery life and potentially life-saving new heart tracking features only sweeten the deal. These improvements will cost you, though: The entry-level, 40m Apple Watch Series 4 starts at $399, or $70 more than the model it replaces. Ultimately though, all of the little improvements have made a lasting impact on the overall Apple Watch experience. If you’re considering buying a smartwatch for your iPhone, this one is worth the splurge. How would you rate the Watch Series 4? Aside from some minor changes, the first three generations of Apple Watch basically looked identical: They were slightly chubby squircles with small, rectangular screens lodged in the middle. This year, Apple took that classic design and flattened it out a bit — the 40mm and 44mm Watch bodies are slightly bigger than before, but sit more comfortably on my wrist. It definitely helps that the redesigned sensor cluster that presses into your skin isn't as pronounced and bulbous as it used to be. The difference isn't that stark compared to older models, but I've definitely forgotten I was wearing the Series 4 until I glanced down at my wrist. Of course, we all know why Apple built these bigger bodies: They were meant to accommodate bigger screens. These new displays are about 30 percent larger than the screens they replace, and they stretch almost entirely across the Watch's faces. For one, it allowed Apple to squeeze more information onto a single watch face (more on that later). By excising the bezels around the display, Apple made these tiny screens just a bit more immersive. The changes don't end there. The tiny speaker wedged into the Watch is noticeably louder than in previous models -- perfect for listening to Siri responses and Walkie-Talkie messages. Apple also moved the microphone to the Watch's opposite side to help prevent interference and feedback. Meanwhile, the digital crown -- the tiny dial on the Watch's right side -- has been slimmed down too. It's just as easy to use as before, but the Watch now haptically clicks when you use it to scroll through long lists. It's a neat flourish, though hardly necessary. Oh, and the side button now sits flush against the Watch's body. This doesn't actually affect the way you use the Watch, but it seems like an obvious way to prep people for the kind of solid-state, pressure-sensitive button that's rumored to be coming to the Watch next year. Some of these may seem like small tweaks, and they are. Taken as a whole, though, they make the Apple Watch considerably easier and more pleasant to use. These improvements do, however, come at a cost: The aluminum 40mm Apple Watch costs $399 -- that's a fair bit more than some of its closest competitors. If you want the slightly bigger 44mm model (which is what I've been testing), that'll set you back $429. And if you like the idea of leaving your phone at home entirely, LTE versions of the Series 4 cost $100 more than their standard counterparts. Premium band options and more elegant finishes like this year's gold-tinged stainless-steel drive prices up even higher, but most people won't concern themselves with those up-sells. The point is, $400-plus for a watch isn't an insignificant amount of money, and Apple really needed to justify that additional cost with better functionality. Long story short, it did. So yeah, Apple changed a lot this year -- what's the Series 4 like to actually use? It's pretty great, and that's largely thanks to three factors: the screen (which we've already discussed), the new S4 chipset inside the Watch and the expanded functionality provided by watchOS 5. A few notes on the S4: Apple went with a 64-bit, dual-core system-in-package this year, and as a result, the Series 4 runs more smoothly than just about any smartwatch I've tested this year. With older models, I'd occasionally see some lag when switching between different watch faces and menus. Now, Watch apps launch and resume almost instantaneously. 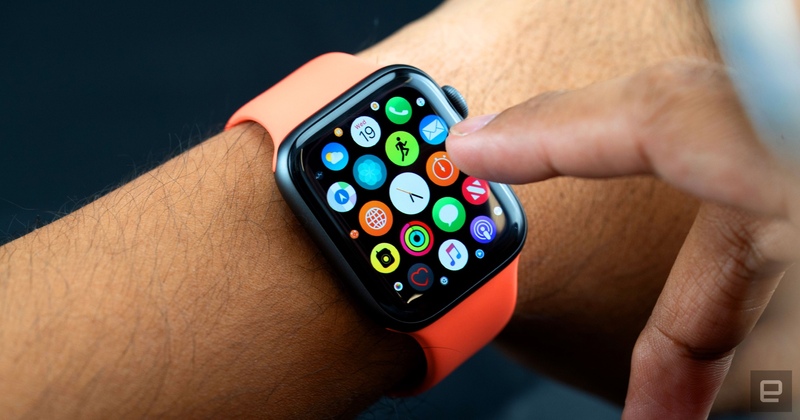 In years past, it felt like the Watch was just a tiny, occasionally frustrating intermediary for the iPhone it was connected to. Sure, you could get some things done, but it was often easier and faster to just whip out the phone and handle things the old-fashioned way. With the S4 in place, the sort of latency between wanting to perform a task and actually completing it has largely evaporated. As a result, the Series 4 Watch feels less like a go-between and more like a natural extension of the iPhone. Consider this: The idea of multitasking on a wearable sounds as absurd as it did years ago, but bouncing between a handful of Watch-optimized apps is perfectly doable on the Series 4. In fact, with the added power of the S4's processor, being productive without whipping out your phone is way more pleasant than I expected. You probably shouldn't spend your entire day reviewing emails, firing off messages and listening to podcasts on your Watch, but you definitely could. For whatever reason, I could breeze through most of the activation process, only for it to fail at the very end. Repeated attempts (plus some calls to AT&T) have yet to fix the issue. I even tried manually changing the eSIM ID and MEID attached to my existing wearable line, and that didn't work either. As such, I haven't been able to test the Series 4 as a completely standalone wearable yet, but I'll update this review when I have. And to be clear, this is almost certainly some weird AT&T ordering issue (as confirmed by customer service) and not some inherent flaw with the Watch. That said, if you also run into trouble transferring service to your Series 4, let us know in the comments. An improved processor wouldn't count for much if the software running on it fell short, but watchOS 5 packs a lot of improvements and features that build off a strong platform laid in earlier generations. There's a lot to dig into here, but you're going to notice those new watch faces before anything else. In addition to the classic selection, Apple added a handful of faces that really take advantage of the extra screen space here. By default, you're going to see the new Infograph face, a densely packed option that crams eight complications into the space on and around a standard watch dial. It's a lot. Too much, arguably -- the whole thing can feel like information overload if you're not careful. Thankfully, it's easy enough to remove a few complications. And if you just need a break from information altogether, options like the visual stunning Fire, Water and Vapor watch faces provide lots of eye candy and precisely zero complications. The complications come with one caveat: They don't all fit into every available spot. 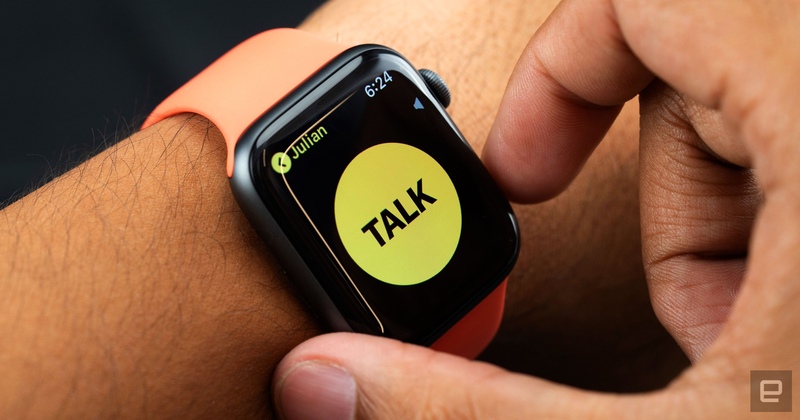 Some, like Walkie-Talkie, Home, FlightStats and more, can't be squeezed into the longer complication spaces that curve under the watch dials on certain faces. This isn't a big deal, but it means you can't completely customize the way your Watch looks or behaves. Some of watchOS 5's new features were basically just carried over from iOS 12. Developers can now bake specific app actions into notifications on the Apple Watch, much like they could on iPhones and iPads. Oh, and you can now ask Siri to carry out any of the shortcuts you've already created in iOS 12. If the corresponding app can perform the requested action on the Watch, it will. My "news me" command, for instance, brings up a list of spotlighted stories on my wrist. Siri is normally quick to respond, but it does tend to slow down when presented with more complex shortcuts, including one that pings CityMapper to tell me how long my subway commute home is. Total waiting time: about five seconds. Speaking to Siri just got easier, too. In addition to holding down the Digital Crown or saying "Hey, Siri," you can now just raise the Watch to your mouth and start talking. If you're anything like me, this will quickly become the only way you talk to it — so far, the Watch has done a great job recognizing the motion and listening to my commands. Throw in some new weather data, webpage previews and support for school IDs, native and third-party podcast apps, and you've got watchOS 5's in a nutshell. There is one more feature I need to address, though: Walkie-Talkie. Late last week, while I was working on our iPhone XS review, something amazing happened. After a few quick haptic buzzes, my friend's son William — who had gotten access to his dad's Series 4 — asked me through my wrist if I liked Beyblades. What could I do but say yes? That was honestly a pretty stressful week for me, but chit-chatting with a child for a few moments did a lot to lift my spirits. To me, at least, that's what makes Walkie-Talkie so great. This might sound cheesy, but it's like having a friend drop by unexpectedly. To be fair, the experience was less than perfect. During my first few days with the Watch, invitations to Walkie-Talkie chats often went undelivered, even when the intended recipient was standing in front of me, waiting to respond. Those invite issues seemed to work themselves out after the Watch officially launched, though. Now my only gripe is that there's no way to set up Walkie-Talkie group chats. Once upon a time, I was fairly active and took care of myself. Then I started chain-smoking and my back exploded the moment I turned 30 so, yeah, not so much anymore. The point is, I've been trying to whip myself into shape for a while now, and the Series 4 offers plenty of tools to help. First, the basics. As far as step tracking goes, the Series 4 has been great — its step counts differed only slightly from the Fitbit Versa. This year, the Apple Watch is also capable of tracking fitness stats for yoga and hiking. I'll admit I haven't tested these much -- I'm not particularly limber, nor am I a huge outdoorsman. The Watch tracks elapsed time and calories burned while you're doing either, but it'll also try to monitor your elevation while you're meandering up a trail. Honestly, it's a little odd that the Watch didn't already support yoga tracking -- the company has been encouraging deep breathing and mindfulness with the Watch's Breathe feature since watchOS 3. Then again, it's also a little odd that the Apple Watch is only now getting automatic workout tracking. Better late than never, I guess. If you're performing one of the Watch's supported exercises, like walking, running or cruising on an elliptical, it'll automatically kick off a workout if you forgot to do so yourself. To test this, I made one of the worst mistakes in recent memory: I jumped on a rowing machine at my gym and went for it until I couldn't move. This was poor form, to say the least, but the Watch did notice I was dying on a fake boat after a few minutes and -- after asking my permission -- tracked my workout until I let go of the handlebars and cooled off for a few minutes. Turns out Apple didn't shortchange me, either: It seemed to have collected data from the first few minutes of the workout before I actually asked it to start monitoring me. That the Watch offered a surprisingly complete picture of my workout was a pleasant surprise, and I've started to lean on this feature consistently as I try to get back into shape. I have to note, though, that the Series 4 has absolutely no way to automatically recognize or track strength training while you're, say, mid-deadlift. I get that Apple trained its motion-recognition models to focus on a small number of popular, easily accessible workouts, but here's hoping watchOS 6 starts to provide options for people who are trying to do more than just lose weight. Those motion-recognition models I mentioned really are fascinating, though. And in addition to helping track your workouts more accurately, they might also come in handy when you need help the most. Apple has been trying to make the Watch a first-class fitness tracker for years. What's really new -- and to some, slightly unnerving -- is Apple's focus on turning the Watch into a wearable guardian. Let's say you're out for a stroll when you stumble over your own feet. (This is, sadly, not unusual for me.) If you have the Series 4's fall detection feature enabled, the Watch will spring into action and ask if you're all right. In the event you don't respond for a full minute (complete with obnoxious alarm sound) the Watch contacts emergency services and pings your preset emergency contacts. I have no shame so I've thrown myself around this office more times than I care to admit in the hopes of triggering that fall detection. No dice -- the Watch is looking for specific changes in wrist motion and acceleration before it raises a flag, and it's sophisticated enough that false-positives are very hard to come by. As thoughtful as this feature sounds, though, it can only help you if you've specifically turned fall-detection on. The exception to this rule is if you're 65 or older, in which case the feature is enabled by default. Having the feature on doesn't noticeably affect the Watch's battery life and it's difficult to trigger accidentally, so really, there's no reason not to enable it on day one. That said, the feature's benefits are crystal clear for older people and their caretakers -- even short falls can severely injure the elderly, and if they happen to be wearing an Apple Watch, it basically acts like an ML-powered LifeAlert pendant. As of this year, the Apple Watch now also pays closer attention to your heart. Heart-rate monitoring has been a key feature since the beginning, but now the Watch is set to warn you when your BPM is too high or low while you're at rest. (These thresholds can differ between people so you can set your own range inside the Watch app on your phone.) Thankfully, my heart tends to hang out at around 60 to 65 beats per minute, so I haven't had to deal with one of these chilling warnings. Hopefully, you won't either. As a heart-rate monitor, the Series 4's best days are yet to come. Despite all of Apple's big talk about the turning the Watch into a wearable ECG machine, you won't be able to use the Series 4 as one until Apple activates the feature later this year. Same goes for the Watch's ability to detect and flag irregular heart rhythms. Both of these features were cleared by the FDA just one day before they were announced on-stage in Cupertino -- a significant milestone. Clearances aside, just keep in mind that neither of these smart heart features is meant to completely replace traditional diagnoses; it's best to think of them as early warning systems. I'll revisit this review when these features go live, but for now, you'll just have to listen to your heart yourself. Apple says both versions of the Series 4 are rated for about 18 hours of use, but -- as usual -- that's a pretty significant low-ball. I've been able to wear the Apple Watch for between 24 and 36 hours before needing a recharge. Obviously, that's going to change depending on what you use the Watch for, but even after full days of fairly consistent tapping and prodding, I could still go to bed knowing the Series 4 would wake me up in the morning. If you're very careful to use the Watch sparingly, you could get it to hit a full 48 hours. That takes work, though, and if you drop the Watch onto its magnetic charger for about half an hour once a day, you shouldn't ever have to worry about longevity. That said, it wasn't that long ago that I tested a premium smartwatch with nearly four days of battery life, so it wouldn't be fair to say the Series 4's battery is best in class. By now, it should be clear that the Series 4 is a significant upgrade over earlier models. I'd even say that, as far as complete packages go, this is the best smartwatch money can buy. But that doesn't mean the Series 4 can do everything I wanted it to or even everything its competitors can handle. Now that these things have bigger screens, it really would've been nice if Apple had cooked up an always-on display mode so you could quickly glance at the time while you're doing other things. Apple wouldn't comment on why the Series 4 doesn't have this feature, but it probably wouldn't be too difficult to implement with this hardware. If you like the idea of always being able to see what time it is -- which isn't a huge ask for a watch -- you may want to consider Samsung's Galaxy Watch ($329+). In addition to that always-on display, it also packs a fantastic rotating bezel for on-screen navigation and between two and four days of battery life, depending on the size you're looking at. It's also kind of weird that Apple hasn't figured out how to work sleep tracking into the Apple Watch yet. You'll find the feature in lots of wearables, and Apple bought a Finnish sleep-tracking company last year, so it's really only a matter of time. Until then though, smartwatches like the Fitbit Versa ($200+) do a great job of monitoring your sleep in addition to your fitness -- when I reviewed it earlier this year, I was a little taken aback at how bad my sleep quality was. Considering the Apple Watch's focus on building a better you, this absence of this specific insight feels pretty conspicuous. Apple has done a lot of work here, and nearly all of it is excellent. The big-screen redesign was long overdue and well-executed. The Watch's performance has improved to the point where it more or less just does what you need when you need it. WatchOS 5 has made this hardware feel highly capable. And with some crucial heart-monitoring features coming soon, the Series 4 stands to become even more valuable -- not to mention a potential life-saver -- shortly. I have my gripes, certainly. I'd prefer the kind of battery life we get out of rival smartwatches, to say nothing of always-on displays. The Apple Watch Series 4 doesn't do everything I want it to. That said, the Series 4 does everything it sets out to with such polish, such competence, that it's a must-own for people with older Apple Watches and a sign to everyone else that smartwatches are finally coming of age.